to celebrate the flavors of the season. 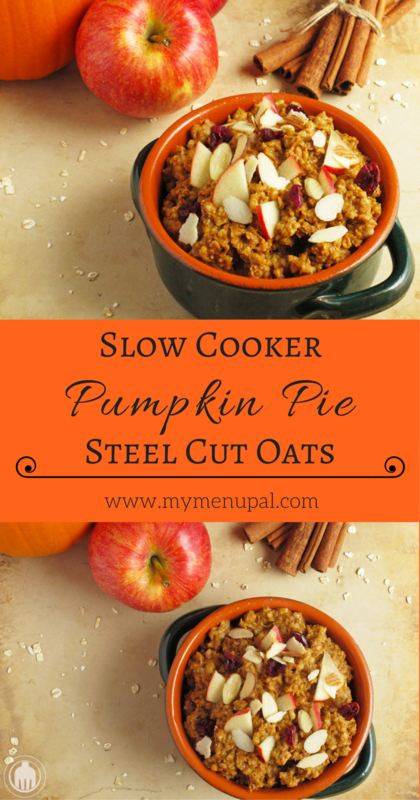 There is much to be thankful for this time of year and what better way to celebrate than to start the morning with an easy breakfast that fills the house with the smell and taste of pumpkin pie coupled with healthy steel cut oats. And that is the theme of this month’s Recipe Redux, our naturally colored or flavored holiday fare. 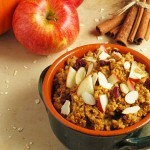 Nothing says Thanksgiving more than pumpkin pie, and why not enjoy it in a healthy oatmeal form?! Plus, who feels like cooking breakfast on Thanksgiving morning? With this oatmeal, you do all the work the night before – which is actually rather simple by just stirring together the ingredients then turning on your slow cooker to do the rest for you. And you’ll be awakened in the morning with the smells of cinnamon, spice and pumpkin. It doesn’t get much better than that, in my book, anyway. 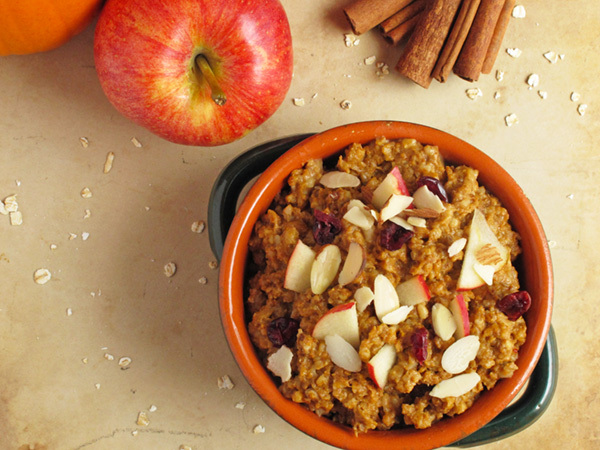 Not to mention, this breakfast is packed with fiber and protein. 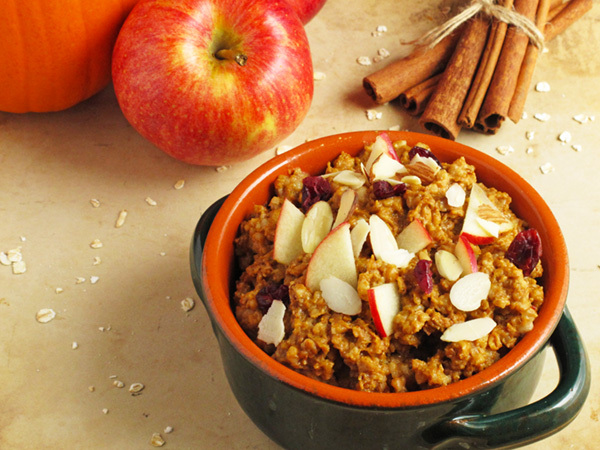 You’ll get almost half of your daily fiber needs, thanks to the pumpkin, flaxseed and oats. I prefer to use soy milk in my oatmeal because it adds a somewhat nutty flavor, though any milk or milk alternative will do. 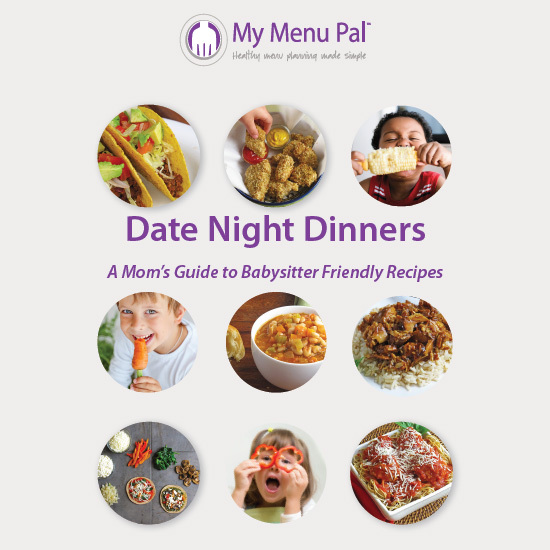 You’ll notice that I do include a particular method of cooking the oats in the slow cooker by using a glass bowl in a water bath to more gently cook the oats overnight. I’ve actually made the recipe doing this method as well as just putting the oat mixture directly in the insert of the slow cooker. Both work just fine, though I felt the bowl and water bath method was easier for clean up and had a better texture overall. If you opt to just cook the oatmeal directly in the slow cooker, I do suggest adding more liquid – maybe 1/4 – 1/2 cup more depending upon how thick you like your oats. 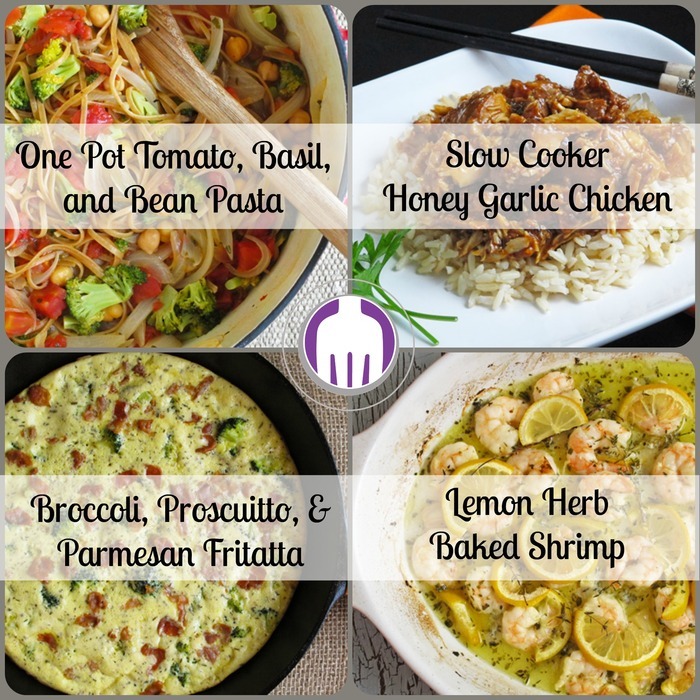 Be Sure To Check Out the Other Recipe Redux Holiday Creations!